JANE: So, Alan, last time we were discussing the psychological oddities involved in the fact that you and I each drive on the wrong side of the road, at least from each other’s point of view. I bet that if we looked, we’d find a lot of other interesting oddities regarding our attitudes toward driving and cars. ALAN: Because the Japanese drive on the left just like we do, we have a huge number of imported second-hand Japanese cars on our roads. I own one myself. It has a switch on the dashboard whose function is utterly mysterious to me. And since the owner’s manual is in Japanese, I’ll probably never find out what it does. JANE: If you want to scan the page and e-mail it to me, I’ll see if my friend, Cale, can translate it for you. It would be a pity if you didn’t realize that you had missile launchers or laser beams… Or even the hover vents that would let you rise about traffic. JANE: If you don’t want to fix it, you can simply listen to recorded music. I gave up on radio a while back. Now I have a selection of CDs I keep in the car. My current favorite is a David Bowie compilation. Jim’s vehicle is new enough that it came with a jack for a data stick. I encouraged him to record a bunch of “his” music, so I can learn more about bands he likes. It’s been a lot of fun. I have a lot more appreciation for Jimi Hendricks, Cream, The Who, and Led Zeppelin than I did. I mean, I’d heard the hits, but now I’ve listened to entire albums. ALAN: We have a CD player as well and so we keep a lot of music in the car for long journeys. Robin and I have eclectic tastes (we like everything except country and western), but our major tastes were formed in the sixties and seventies and most of our music dates from that time. We’d both agree happily with Jim’s selections. ALAN: Yes, but let’s resist the lures of that tangent for the moment. The Japanese cars have an undeserved reputation for being of poor quality. The phrase “jap crap” is sometimes used. There was a huge scandal a few years back when it emerged that the majority of the used imports had had their odometers spun back so that the cars appeared to have done very low mileage. We have much stricter laws now and that scandal appears to have gone away. JANE: That’s interesting. In the United States, Japanese cars, overall, have a very high reputation. I don’t think we’re part of their used car market, though, which may account for the difference. ALAN: Actually, I’ve always found Japanese cars to be manufactured to a very high standard as well. Of course, we don’t have an indigenous car manufacturing industry so all our cars are imports, both new and used. There was a time when we assembled cars under license from overseas manufacturers, but we don’t even do that anymore. However I’m not in the least bit surprised that you don’t have Japanese imports. After all, you’d have to swap the steering wheel round before you could drive them. I am not an expert on cars by any means, but I do know that many “foreign” cars sold in the U.S. are actually manufactured here. And many “American” cars are wholly or partly manufactured elsewhere. At one point in his life, Jim made a great effort to “buy American.” He bought a Ford truck, only to find out it had been built in Japan. His next vehicle was a Ford Festiva, which had been built in Korea. His next vehicle was a Nissan truck, which he learned had been built in Tennessee. The truck lasted him for something like nineteen years. It was still running when he traded it in, but he decided he’d really like to have air conditioning. This time he didn’t bother to check who made what where and bought based on the reputation of the vehicle. So we now have a Subaru Forester and he likes it very much, especially the air conditioning and the ability to play his entire music collection. ALAN: We have a Subaru as well. It’s a Subaru Legacy – just a car though. Not a truck. The British have always enjoyed eccentric motor cars. The Reliant Robin which had three wheels and a fibreglass body, and the Austin A30 which, as an economy measure, had only one windscreen wiper (a passenger side wiper was available as an optional extra). ALAN: In another life, Robin was once a car mechanic in a garage. She specialised in minis because she was the only person in the garage whose hands were small enough to get into all those awkward places. There was so little space under the bonnet that other garages had to dismantle and then remantle the entire engine to do even the simplest maintenance jobs. But with Robin on the job, that wasn’t necessary. I wonder what that means? ALAN: Speaking as a man, I have to say that I think Freud was perfectly correct. Sometimes a cigar really is just a cigar. JANE: Bet it couldn’t! Now, I need to go write, but I don’t think we’ve exhausted (get it, “exhausted”?) the topic of cars quite yet! This entry was posted on October 16, 2014 at 1:00 am and is filed under Thursday Tangents. You can follow any responses to this entry through the RSS 2.0 feed. You can leave a response, or trackback from your own site. Yeah, I suppose you can’t simply make mirror image blueprints when you want to manufacture cars with the steering wheel on the wrong side. I suppose you Kiwis have the accelerator on the right and the brake on the left, as we do? Probably the greatest perturbation in the Force was an old Range Rover I drove at work a while back (this was on a private nature conservancy, and the place was pretty rugged). Her name was Thelma, which fitted her personality perfectly, but Thelma’s steering wheel was very properly on the left. How the British could stoop so low I have no idea, but there you have it. Driving instincts are strange things. 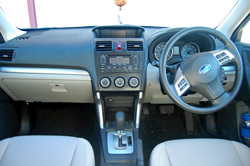 For many years I owned a car where the gear lever was on the steering column. The car I bought after that one had the gear lever on the floor, where it should more properly be, of course. Nevertheless, for months I kept trying to change gear with the windscreen wiper control. Trust me — that doesn’t work! Oh… I’m laughing so hard tears are coming into my eyes. That said, my mom tried to teach me to drive in a car with a manual transmission and the gear lever on the steering column. She kept insisting I’d “feel” the right positions. I kept swearing I couldn’t. This cured me of any desire for a manual transmission and I have always driven automatics. After, mmm…. 18 years, I’ve reached the point where I only go tor the clutch in emergencies. You have to go out of your way to buy a standard around here now. Had a friend who was nuts over Morris Minors, the old ones that had little metal flags that popped out of the side just behind the front doors to serve as turn signals. Very cute car, though not as small as a Mini. She never had one that actually worked, so I never got to ride in one. These were all adjusted for the States, though: steering wheel on the left side. Okay, I have to jump in and say something about music…Alan, you say you don’t like country and western–fair enough. There’s a lot of it I really don’t like, especially the newer commercial releases. But I have to recommend the album Heirloom Music by Jimmy Dale Gilmore and the Wronglers, released in 2011. The songs are all depression-era or older, done in a traditional old-time style. The musicianship is incredible, and you can tell that they all just had a blast recording this. In my opinion, this album represents some of the best of American traditional music. So, cars…My 1995 Ford Taurus is currently stuck in my driveway with a dead battery. I should be able to fix that this weekend. I’ve found audiobooks great entertainment while driving, although some find them distracting. Another even better one is old radio shows on CDs or satellite radio (or cassettes if any cars still have tape players). You can get adapters to play cassette tapes via car radio, I think. Better would be to get a deck that plays both cassettes and burns CDs and dub over. I’m assuming these exist, just as you can get machines that burn vinyl to computer files or CDs.